Wildfire in December? This is not normal, said seasoned real estate agents in the Southern California this morning. But tell that to the 60 to 70 mile winds blowing through the region since Monday. At the time of this article’s publication, some 27,000 people had been evacuated from their homes in SoCal’s Ventura County as the fires reached the cities of Santa Paula and Ojai, with 150 structures destroyed, and flames engulfing around 45,000 acres, according to press reports. Local news helicopters and photographs showed an apocalyptic scene, with fires burning entire homes to the ground while sparing others just next door. The fires come on the heels of a brutal firestorm that overtook the North San Francisco Bay in October and ravaged areas of Sonoma and Napa counties. Enterprising independent agent Kevin Paffrath, based in east Ventura, didn’t get much sleep last night. He was helping hose down his father-in-law’s block of four units while buildings nearby “went up like candles.” He then drove around to survey the damage, posting the subsequent footage on YouTube (below). For Paffrath, his usual Tuesday to-do list has been torn up this morning. The father of a young family, who evacuated south to be on the safe side, managed to buy one of the last generators from his hardware store at 5 a.m. this morning — power outages are widespread — and he is going to be offering it to people who need to charge their mobile phones and the like. Paffrath has received calls from clients with properties in escrow who are asking for updates, so the agent is going around to check on listings. As was the case in Northern California, the SoCal fires have hit top-tier properties the hardest so far. In the hills above Ventura, it was the luxury homes that burned down in the night. 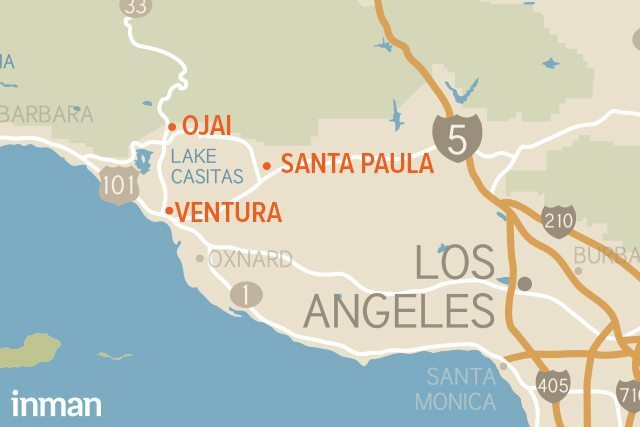 “These were $1.5 [million] to $2 million mansions that people are fleeing,” said Paffrath, who said the median home price of Ventura was $500,000. After seeing homes in flames on the ridge of Ventura city, the biggest danger spot right now are the properties below the hillside, Paffrath said. “The ones on the hill, there is nothing anybody can do,” he added. Paffrath described the remarkable sight of the Ventura City Hall surrounded by gardens all alight with fire. Horses were being brought down from the hills to the Wells and Foothill area with their accompanying hay bails — an odd sight to see in the suburban streets. Meanwhile in the small town of Santa Paula, 13 miles away to the northeast, Kay Wilson-Bolton from Century 21 Troop Realty was heading off as she always does on Tuesday morning: helping organize lunch for 600 homeless and hungry at the town’s food bank. This is despite the fact that she had to evacuate her home in the night with her husband and their four small dogs. Together they decamped to her office in the center of Santa Paula where, by chance, a bunch of blankets had been delivered the day before. “In a crisis, people will need a meal,” Wilson-Bolton said. She had just heard that there is 0 percent containment of the fires near Santa Paula, which was worrying news. In the Ojai community, beloved by Los Angelenos for yoga retreats and getaway weekends, Ojai agent Gabriela “Gaby” Cesena of Berkshire Hathaway HomeServices, managed to sound calm, though she had just evacuated her east Ojai home with her two teen boys 10 minutes before. During a wildfire, the usual escape routes can be cut off. Ojai Valley normally has three roads out, but these options had been reduced to one today, said Cesena, who was taking her family to another part of Ojai. She has been fielding calls in the early hours of the morning from clients — one at 2 a.m who had just moved from out of state and was seeking reassurance, and another who asked Cesena to check on their son at boarding school nearby. As they were leaving, the agent was pleased to see emergency vehicles arriving.